What is the meaning of Tao of Peng? I did try a bit to find out. Both before and after I ate there. Intriguing that Dr. Google has no answer. Or maybe I didn't try hard enough. Maybe it doesn't have a meaning. Or maybe it is complicated. Just like the food it serves. Keep things simple, they say. Sometimes, I guess if you complicate it correctly, you may be able to pull it off! And when faced with situations like this, I feel it is best to leave it to the chef to complicate your meal for you! Thats what we did. How else do you expect us to enjoy food in a restaurant that makes it seem like it is going to serve you some super authentic stuff, when you have your mother for whom Chinese food is incomplete without Manchurian? With others who have traveled around the world and have opinions of Chinese food? A bunch of 5 people with completely different tastes! 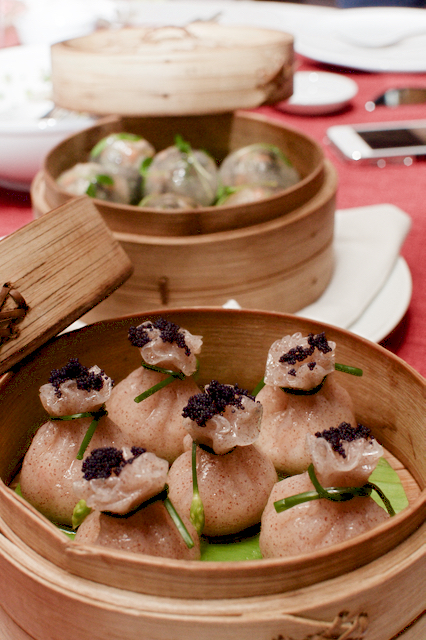 'Start with some dimsums and then we will talk about the main course,' the chef said. When four boxes of dim sums came, I was worried. Mostly about what the bill was going to be! For a minute I thought 'leave it to the chef' may not have been a good idea this time around. Its worked before, but...... oh well. 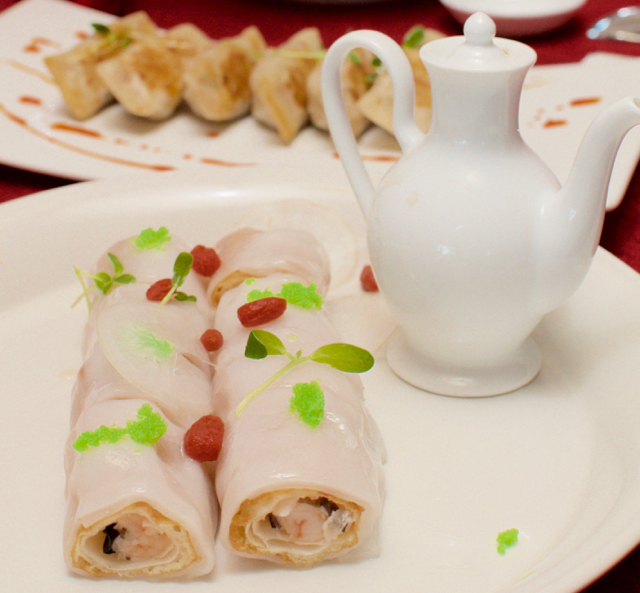 However with every morsel of dim sum, the worry slowly and steadily melted away. Maybe it was the lobster money bags, a fabulous dim sum packed like money bags. Not quite simple, but the flavours were awesome. I am still trying to figure out what the bag is made of. Or maybe it was the prawn stuffed inside something which was stuffed inside something else! All white. And yummy! Especially when the sauce was poured all over it. The wok fried chicken dim sum was gulped down by everybody! And the squid with the salmon caviar! Slurp! With so many dim sums I was wondering what was left to talk about the main course. The sisters wanted something crunchy. The chef came out and did speak about main course. 2 fried rice, 1 crispy prawns and 1 portion of exotic greens. We didn't even argue when he made the suggestion. We had seen enough to trust him. I saw the mom's plate. It was clean after the waiter served her these dim sums. I am safe, I thought to myself. 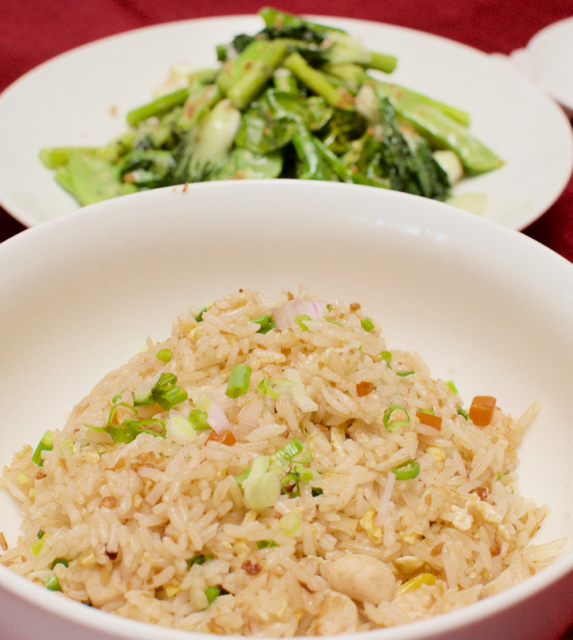 The crisp prawns and the greens magically went well with the fried rice and we didn't need a 'gravy' to go with the rice. The rice was similar yet dissimilar to what we are used to. Authentic but not too authentic. Slightly moist. But mom's plate was clean again. 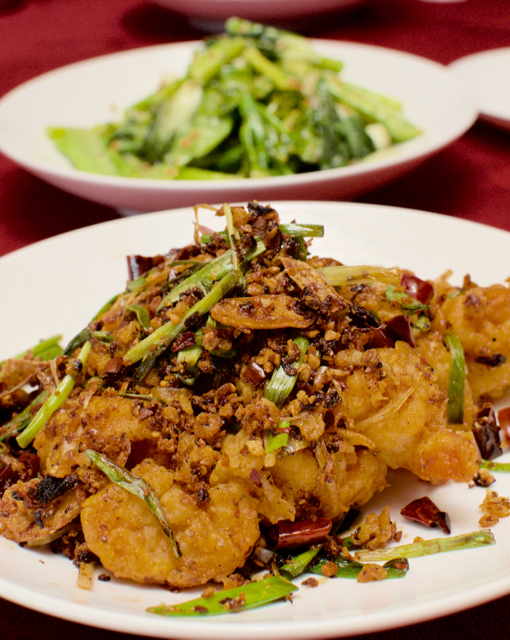 The prawns had that salty crispiness that left the tongue wanting for more. The greens were yummy enough to make salad a staple food! More importantly it gave the meal a nice balance. And dessert. We were full, but the chef insisted we have dessert to complete the meal and offered us one with his compliments. 2 plates of some random name! It had a green tea panna cotta. Panna cotta in China? It wasn't wobbly, but what is more Chinese than green tea? Didn't matter. 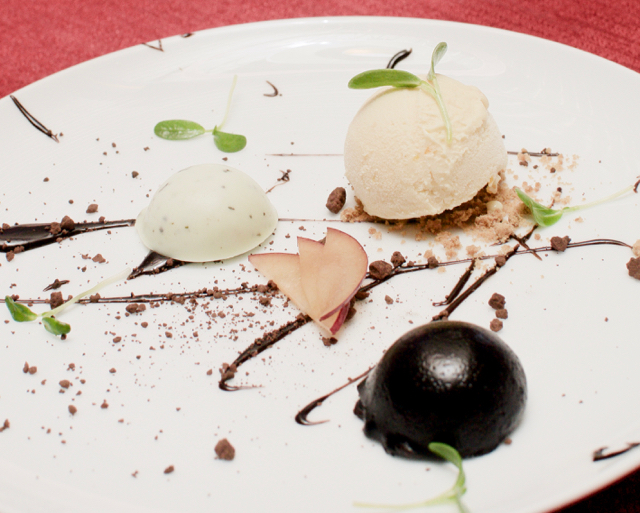 The dish with the orange ice cream and the chocolate with the green tea panna cotta was a super hit with the family. Bill came. Rs. 5699 and dessert wasn't charged. So I am assuming that the dessert, all of which were priced around Rs. 375-425 would have increase the bill to Rs. 6200 and that would mean we paid about Rs. 1200 per head. Allowing Chef Avinash Naha to complicate our meal was a good decision, I guess. Who is this guy anyway? Never heard of him before and here is doling out some super fancy stuff. Have to get to know the guy and his history a little more! Hyatt tried it with STIX, Leela tried it with China XO and these are all very good restaurants, but for me, the best Chinese Restaurant in South India is tucked away in a resort in Mahabalipuram. Given the right media attention, it can give better known ones in the country a serious run-for-the-money! I only wish we hadn't eaten so many dim sums because I am sure there is a lot more to explore in that menu. And about the chef himself. Unfortunately it is a 45 minute drive away! 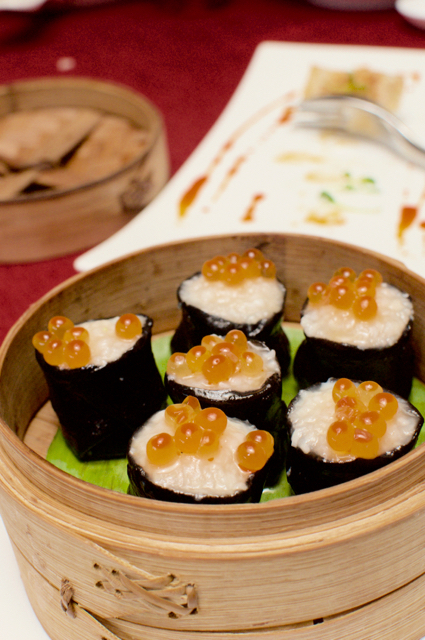 Tao of Peng is the Chinese restaurant in Intercontinental Chennai Mahabalipuram Resort, located about 45 mins away from Chennai on ECR.